Homemade Cosmic Brownies – Little Debbie copycat recipe! Fudgy brownies topped with rich chocolate ganache and sprinkles. Not just moving houses – moving across the country. Like, soon. And I have this huge problem. Chocolate. I have so much stinkin’ chocolate in my cabinets right now and chocolate won’t be making the cut for what’s traveling with us. So what’s a girl to do? Make brownies. Then eat those brownies so she has to make more. Because there’s still more chocolate that has to be used! 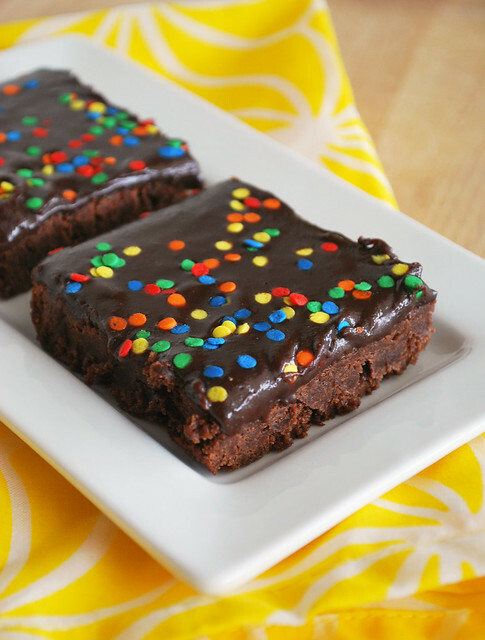 These brownies are supposed to be like the Little Debbie Cosmic Brownies which, if you’ve never had them, are amazing. 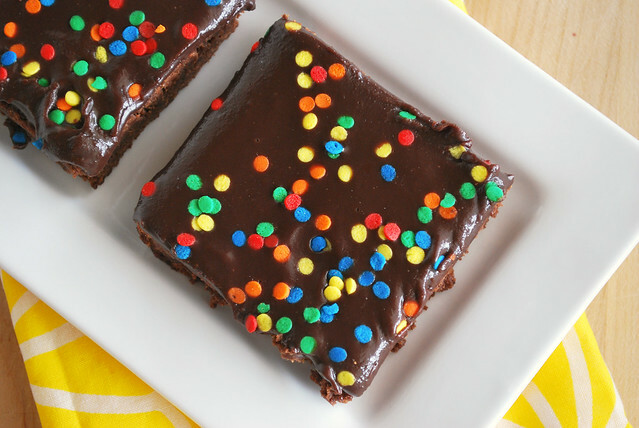 They’re so much more dense than any other brownie and then they’re covered in a rich ganache before being topped with little candy pieces. This recipe is so close to the original! I do recommend actual candy pieces (even something like m&ms) because the sprinkles, while cute, just didn’t give that crunch that the original has. Time to get back to using that chocolate! Leave me any recipes you think I should try in the comments! Homemade Fudge Rounds – soft chocolate cookies with chocolate buttercream in the middle! Homemade Little Debbie Snack Cakes – tiny layer cakes covered in frosting! These are so cute and you can do any shape for any holiday! Homemade Oatmeal Cream Pies – soft oatmeal cookies sandwiched with frosting! Heat oven to 350F. Line a 13 x 9 pan with parchment paper or aluminum foil, then lightly grease. Set aside. In a large bowl, combine the sugars, butter and water with a whisk. Stir in the eggs and vanilla. In a medium bowl, combine the flour, cocoa, baking powder and salt. Stir the dry mix into the wet stuff and stir to combine. With a rubber spatula, spread the batter into the prepared pan. Bake for 18 minutes. Donâ€™t over bake! Set aside on a rack to cool. While the brownies are baking, prepare the ganache: Place the chocolate in a bowl and set aside. In a small saucepan, heat the cream just to a simmer. Donâ€™t boil it, just wait till you see little bubbles starting to form around the edges. Remove from the heat and pour over the chocolate. Sprinkle with the salt and let it all sit for a minute or so. Gently stir with a rubber spatula until all of the chocolate is melted. Whisking the heck out of it will just add air bubbles and we donâ€™t want those. Set that aside to cool a bit. When the brownies are mostly cool, pour the ganache over and spread it evenly over the top. Sprinkle as many or as few of the candies/sprinkles over the top as you like. I cooled mine in the fridge until the ganache was set. When youâ€™re ready to cut them into squares, lift them out with the foil and cut into the size or shape you like. 34 Responses to "Cosmic Brownies"
Oh wow, so exciting! What a great use of your chocolate:-) I have about 10 pounds of hershey kisses to use up so if you have any ideas for those, let me know! Too much chocolate? Oh, how I’d love to have that problem! When I opened the email I instantly was brought back to a Little Debbie memory. They’re great! TOO.MUCH. CHOCOLATE? ImPOSSible! Good luck cleaning out the chocolate! 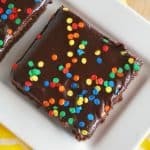 Ok if these really are like cosmic brownies, I need to make them! 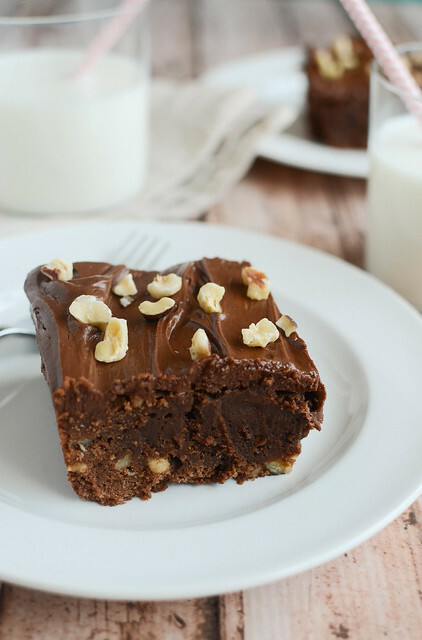 I love a really good dense, rich, fudgy, brownie. Nothing is too rich for me!! The latest really dense brownie that will make you ooh and ahh, well it did me, is my Nutella Brownies w/ cream cheese frosting. Super rich and decadent. Best brownies I’ve ever made actually I’d say. 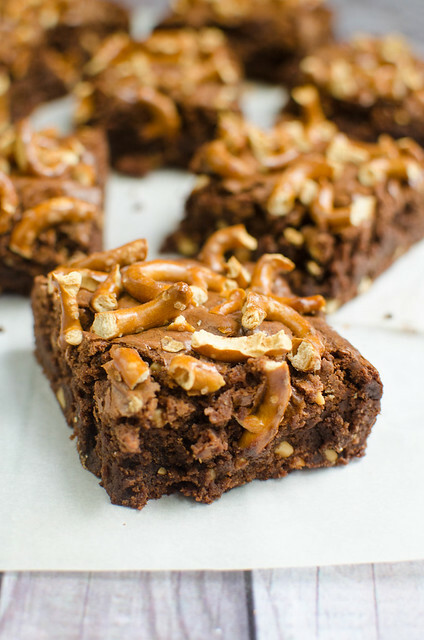 I loved these brownies as a child! Homemade cosmic brownies are much better than plastic wrapped ones! These look so fun! The sprinkles look amazing against the brownie canvas. These were a great lunch box find – but they always seemed to vanish too quickly! This may get bumped to the top of the must try list. these look delish! I bet they taste a lot better than little debbie too. I can’t wait to try these. I grew up on cosmic brownies. What a great use of chocolate. Those look delightful. Little Debbie has nothing on these. I can’t wait to make these. They’ve been on the list since Elle posted them :) they look great! So happy that you like my Cosmic Brownies! Yours look great! brownies are good fuel for packing! these look SO SO good, I’m so impressed! Ooo, I totally remember the Little Debbie brownies with the candy pieces!! My Little Debbie weakness was always the oatmeal cookie and cream sandwiches :D Yours look awesome and yes, dense fudgy chocolate is so amazing. I just had a vegan chocolate cupcake the other day and it was by far the fudgiest cupcake I’ve ever had in terms of the actual cake. I hate when chocolate baked goods are dry! Great, now I want to make these. NOW. 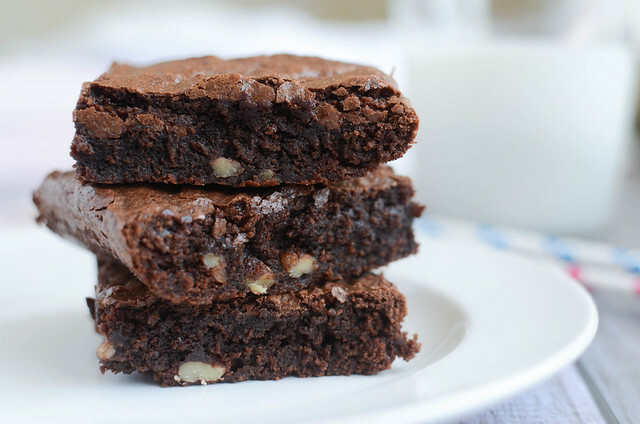 Oh those brownies look amazing! So where are you moving? 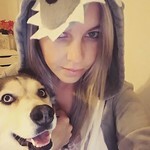 You are my hero!!!!!!!!!!!!!….. in MÃ©xico is not very easy to find them! !… I want to cry!….. so excited I will buy all the ingredients and let you know how did it go! The brownie part was really good, but I didn’t like the ganache. Will probably use semi-sweet chocolate instead of bitter-sweet chocolate next time. It was just too bitter for my taste. Used walnuts instead of the sprinkles. This is the same recipe that’s on the nestle cocoa powder container! Just substituted 2/3 brown sugar instead. That is my favorite recipe. I’ll have to try your adaptation. I can’t wait to make these! My son LOVES Cosmic Brownies!!! Thanks so much! do you store these in fridge? and are they good for several days? want to make this week! I store everything in the fridge but I’m assuming that there’s enough sugar in these to preserve them for a few days if you left them on the counter. And yes, definitely good for a few days! They stayed nice and soft for me. These look amazing! I was thinking for the candy topping you could do nerds? they would have that crunch and color but idk about the taste.